Here is my idea: we will write about lyrics! Great, right? Well, there’s more. I think we need to try to decide what makes for good song lyrics and what doesn’t. Jon, you tell me why I prefer the latter? Is it my elitism, my utter snobbery? Do I hate Jesus? Muhammad? Are there characteristics that good lyrics share? Is it unfair to the Backstreet Boys and to Sexsmith to compare what seems to be an obvious capitalist contrivance with the work of a musician who is arguably the greatest humanist musician living or dead? (I don’t think so.) Do I think that by calling the Backstreet Boys’ slag the basest of materialist dregs I’m ruling out the possibility that some members (the sarcastic ones) of their audience like them for just that reason? (Maybe.) Regardless of the answers, I’m open to having examples of my judgment errors pointed out. I’m eager to hear your thoughts. My initial reaction is that we would be doing ourselves an injustice not to tread lightly on comparisons such as the Backstreet Boys to Ron Sexsmith; not only because of the enormous gap in the quality of the lyrical work, but (more importantly) the fact of the matter is that the Backstreet Boys are only the salesmen of a “love song” written by Gary Baker and Wayne Perry. It is not an unfair comparison, if there is such a thing, but I would argue it may be the type of comparison unworthy of much invested time or effort. 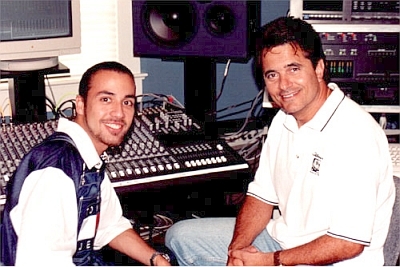 While there are plenty of good songwriters to seek out that don’t, in fact, perform or record their own material, my personal opinion would be that fewer of those cases would be worth our time than if we focused on performing songwriters. This is a side to the lyrical criticism that we should be aware of going into it. I also think focusing too much time on content like the Backstreet Boys would have a higher tendency to steer us in the direction of negative criticism, which, from what I gathered after reading the introductory letter you sent me, is not the main intention or motivation of [sic]. That being said, I can assume the Backstreet Boys example was mainly to prove a point. Who should be considered (or excluded) for examination? I would think that in an effort to expand our collective knowledge base, we should make efforts to reach beyond the immediate and accessible areas of expertise we may have (or think we have), and investigate things new and foreign to us as well. Let’s keep the idea of writing a song about “songwriting” on our plate so to speak, while we begin our attempts in dissecting the qualities shared, if any, by lyrics we consider to be good. With that in mind, we should at least touch on the shared qualities of bad and average lyrics as well, if for no other reason than to help clarify what we consider good lyrics to be. I would suggest concluding any messages sent with a different lyric considered to be good, whether to elicit critical response or just express your own desire of those particular lyrics to actually be heard by someone other than yourself. Thanks for the prompt and unsurprisingly thoughtful reply. To address your first point, I have to question your reasoning for treading lightly on comparisons between the Backstreet Boys and Sexsmith. You point out what you call an “enormous gap in the quality of the lyrical work” of the Backstreet Boys. That is precisely what I’m hoping we can get at: what determines the “quality” of a lyric? 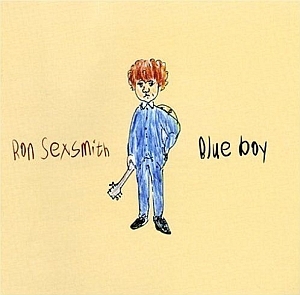 Sexsmith’s lyrics, to me, display characteristics such as nuance; avoidance of cliché (except in instances where he seems to reinterpret clichés); and reconciliation of lyric and personal philosophy (this being built throughout a body of work and only hinted at in a single lyric). Do I have to associate these characteristics with the word “quality”? I don’t think so. Would it be objective to say that these characteristics enrich lyrics? I do think so. 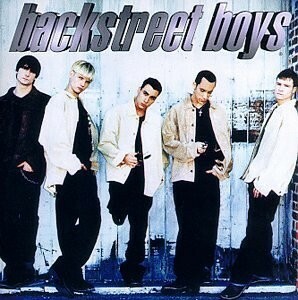 Lyrics sung by the Backstreet Boys seem to display the opposite characteristics: obviousness and a shallow connection between the performers and what they’re singing. If we can agree that “rich” is more objective descriptively than “of high quality,” perhaps we can also agree that the lyrics sung by the Backstreet Boys are often less rich than those of Ron Sexsmith. I’ll go a step further since dictionary.com lists nineteen definitions for “rich.” The first definition seems to have the most in common with my sentiments: “having wealth or great possessions; abundantly supplied with resources, means, or funds; wealthy.” I’m especially drawn to that phrase, “abundantly supplied with resources.” One resource–back in the context of lyrics–could be that complexity (a complexity, I will add, that does not overwhelm the text: it is not complex for the sake of complexity) that many of Sexsmith’s lyrics have. Other resources could be the use of literary devices or the unusual or especially imaginative uses of rhyme and structure. This is “rich.” What do you think? Another issue I’d like to discuss briefly, while I remember, is that word, “lyric.” Etymologically, a “lyric” is something written to be sung to the lyre. A point I would like to discuss is whether or not a lyric can stand on its own without that lyre. Can we reduce our discussion to one about the text alone? I know that I may confuse this objective by bringing the Backstreet Boys into the equation. My point in doing so is not to try to give lyric-writing credits to the band members. My point is that there are words being sung. What are the words? What do the words mean without the music and without the commodification? 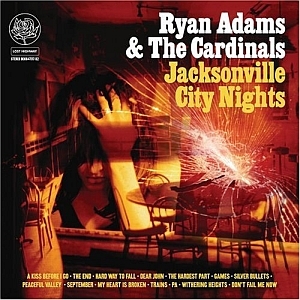 All of that said, how does Ryan Adams’s work hold up to scrutiny? I get the impression from your last response that you feel Adams, being a “performing songwriter,” is more “worth our time” than some others. What does all of this mean? I’ll try to answer this from start to finish. I notice a name here. Who is “Laura”? I wonder. The narrator doesn’t help much. I don’t know her age or her relationship to the narrator. We’re not given much about her character. We know, basically, how she is making a phone call and to whom. She says she will never see winter again. That she “mimics a noose with the telephone cord” shows, perhaps, that she has a gallows sense of humor even about her own mortality. What about September? This may be the month in which the narrative occurs. September is near winter. So, it might be safe to say that Laura will be dead in less than a year. What’s killing her? The narrator doesn’t say. The narrator states fairly clearly, I think, that he visits Laura’s grave and drinks ’til he is sick. He mentions that he talks to himself “in the dog days of the summer.” My understanding is that the dog days are called such because of an ancient correlation between Sirius and the sun during the summer. Dog days occur contemporarily from early July to early August. So, we might be able to say that Laura died sometime between September of one year and July of the next. What do we know about the narrator? Above, I attributed a gender to the narrator by saying “he visits Laura’s grave.” My assumption is that the narrator and Ryan Adams are the same person. But, I don’t know this. If we imagine the singer to be a woman, does the meaning change? Not for me. I feel you coming from where? I feel you coming to where? I feel who coming? Does the narrator feel Laura coming back from the dead? Is the narrator “Leaving Las Vegas” (i.e., killing himself with alcohol) and, thereby, getting closer to Laura? This line aside, what’s the overall point? It seems simple: the narrator is sad that a person he/she cared about died. So, does Adams’s presentation of “I am sad” have richness? Those are my thoughts and questions for now. I think examining the quality of a lyric and what determines its quality is definitely our starting point in these inquiries. We ought to be careful about which qualities are regarded as the most important, as those may vary from person to person. I think it’s important to at least attempt encompassing as many of these qualities into our definition of a good, or “rich” lyric as we can, some of which you’ve already listed: avoidance of cliché, nuance, and complexity to name a few. But there are many more qualities of a lyric that I find particularly interesting. Maybe attempting to give lyrical “richness” a handful of categories with which we use to determine their merit would be the way to go. Categories I think could be considered would be things like Originality (which ties into avoidance of cliché), Rhyme (under this category would be both examples of use of rhyme, as well as the ability to forgo rhyme effectively), Complexity (both looking at complex lyrics and effectively used simplicity in lyrics), etc. I think if we could agree on enough categories that determine a song’s richness, we would have a more consistent approach to analyzing lyrics, which will help not only the two of us, but anyone else that cared to join the process in the future. One thing that’s a little bit of a touchy subject for me is the idea of looking solely at the words being sung, as opposed to looking at those lyrics in the context they were intended. The music itself is no less important many times in conveying the overall mood, and reinforcing the lyrics. You’re right, there are words being sung, but I would stress the fact that they’re being sung, and to take the lyrics out of context of the song itself is the equivalent to reading Shakespeare, as opposed to performing Shakespeare or seeing it performed, as was usually the intention with the majority of works he wrote. I think if you’re allowed to scrutinize anything someone has created, the least respect that can be paid the author is to scrutinize the work in the context it was intended whenever possible. The way that some songwriters use phrasing to emphasize certain words is something you will often lose from inspecting the text alone. It also neglects other interesting things such as the way some people are masters of what I call “strange rhyme”, where they are constantly deconstructing syllables to carry over into new musical measure (Alanis Morissette and Dave Matthews immediately come to mind as examples of that). To take the entire realm of critical thought down to only the word itself negates the human aspect of the piece in my opinion. Yes, they are words being sung, but those are words in a song that another human being created. Do words exist outside of humanity? If we were wiped off the planet today, our words may well continue to exist, but what value do the words themselves contain without someone to speak them, let alone comprehend them? Just something I think may be worth hashing out. As far as that Ryan Adams song goes, I found it interesting that the lyric that troubled you the most was one of my favorites in the song. It’s definitely a line that has enough vagueness to be open to interpretation. The ability to write a lyric that a person can relate to is a difficult one (partly because as an author, you have no real choice what people relate to), and this has always been a line that I personally relate to, based solely on my interpretation of its meaning. To me, the line “I feel you coming but I don’t know how” is just an acknowledgement of a person that can have a profound effect on your thoughts and emotions, even in their prolonged absence. Whether he’s singing this song about his mother, a lover, or even just singing about that feeling of losing someone you’ve loved, I think that line really captures that idea. Instead of saying, “I don’t know how you’re able to affect my thoughts and emotions this significantly after all this time, but you do,” he says “I feel you coming but I don’t know how.” That’s always been my interpretation of the lyric. There are definitely qualities of richness in this song for me. Without need for detail about who Laura is, he’s able to convey that she has a unique outlook on life, and an ability to face death in a way that most people simply cannot: with some degree of comfort, happiness, or acceptance. It has a somewhat unconventional and original style of writing, where the chorus is a single word repeated. This adds to the feeling of despair or desperation in the song for me. I’m already starting to think there are going to be many less writers whose lyrics will hold true as being “rich” under scrutiny than I originally thought. “Allowed”? “Respect”? If someone were to look at something I wrote and tell me, “that’s really beautiful” when he really meant, “that’s a really beautiful melody but a dreadful, vomit-inducing, sappy, ridiculous lyric” I think the person would be doing me a disservice. That would be disrespectful, I think. And anyway, are all authors doing us a service inherently deserving of our respect? I feel I’m allowed to scrutinize something the moment my senses are able to interact with it. What does the author have to worry about if she has done her job? Couldn’t the author, having a potential flaw addressed, find a better way to word or perform something? “Wouldn’t a performance flourish be that much more meaningful if the words beneath it could stand alone? That said, I do not disagree completely with you. I think it probably is safe to say that seeing Shakespeare performed is more meaningful than reading Shakespeare. Shakespeare might not prove your point all that well in the end, though. I feel I can read a lot of it and point out many elements of richness without the performance. And isn’t Shakespearean performance just stage direction and arrangement of characters/props? Can’t we describe that extra layer of meaning by describing what the character is doing while delivering lines? If I were analyzing a film, I would call this the mise-en-scène and it would be easy to freeze a frame and dissect its constituents. I would be dissecting the mise-en-scène. Can’t we do this sonically? You’ve already gotten the ball rolling by citing a couple of singers who sing certain things a certain way. So, let’s take a look at a specific set of Matthews or Alanis lyrics and see if they do these things decoratively or if it adds some kind of richness. Let’s take a look at someone’s mise-en-song. Do words exist outside of humanity? If we were wiped off the planet today, our words may well continue to exist, but what value do the words themselves contain without someone to speak them, let alone comprehend them? Would Dave Matthews’s syllabic stylings be meaningful without Dave there to syllabate them and someone else to listen? Of course I want believe that there is richness in the way things are performed. Can we agree, though, that it would be better, richer even, if the strength of a lyric didn’t depend on that performance? Wouldn’t a performance flourish be that much more meaningful if the words beneath it could stand alone? The performance is, to me, a layer of the work’s humanness, not the sum of the work’s humanness. 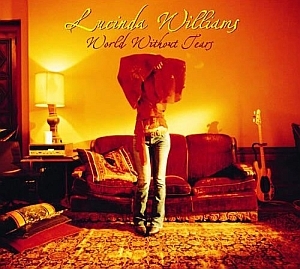 I wonder how much Lucinda’s lyrics help to prove your point. Her text alone causes severed to find my heart. I happened across the last third of the recent Texas Chainsaw Massacre movie last night. In it, Leatherface shoves a chainsaw into a bunch of torsos. Reading those lyrics, I feel a more specific sympathy for those torsos. And hearing her sing it does add a richness for me. Can you imagine Whitney Houston singing it? Certainly it would still be a beautiful song. But, I can imagine that lyrical beauty getting smothered in a bombastic, string-filled Production. Williams sings it with that ragged, slurry, drawl almost as if to hide her lyrical richness. My ears have to chew it up like some kind of musical jerky to get to the underlying flavors. “So, what,” I might ask myself, “would my ears do to Whitney’s version?” They would chew it very quickly, I think, like that faux chocolate that’s so prevalent around Easter. That stuff has the look of chocolate, but it’s really impostor chocolate–all corn syrup and hydrogenated oil. My ears would regret the brief pleasurable sensation because it would, very soon, give me brain indigestion. I’m glad I live in the real world where there are still tears. I’m glad I can look for the source of those tears and try to provide some comfort. I feel disrespected when Whitney puts a glitzy mask over a rotting cadaver. I want the truth. I want Lucinda. I suppose I should be more careful with my words around you, as I can appreciate your view that my using “allowed” and “respect” in that context is inappropriate and could even be construed as offensive. That said, I think you grasped the broader point I was making about a lyric, or any work of art, being looked at in the intended context. I think that, yes, if a lyric can hold up on its own, it may be superior in the sense of a literary accomplishment. But I can give you specific examples in music where you would miss the author’s unique interpretation of the lyric if you had merely read the words. It also neglects other interesting things such as the way some people are masters of what I call “strange rhyme”, where they are constantly deconstructing syllables to carry over into new musical measure (Alanis Morissette and Dave Matthews immediately come to mind as examples of that). By the “deconstructing syllables” comment, I merely meant that they have a unique focus on deconstructing the words themselves into separate syllables, which seems to be done to make the vocal itself percussive. It’s a really interesting way to look at words and the way they can be used almost as another instrument in a song. The following songs and notes on each should provide reiteration of this idea, should you choose to listen to them. Alanis Morissette’s “Knees of my Bees”: Pay close attention to the line “You are a gift renaissance with a wink, with tendencies for conversations that raise bars” for a prime example of what I meant by deconstructing a word to syllables. She is the kind of lyricist that is interesting in her ability to write any lyric, and then fit it to a song with this technique of using the syllables themselves to your advantage, along with the words. Dave Matthews’s “Raven”: This is less an example of a “good lyric” than it is an example of how interesting a percussive lyric can be. I think I could safely say two things about a song like this. One, if you just read the lyric, or even if it were performed by someone other than Dave Matthews, I think it would likely be uninteresting and far from noteworthy. But, it is interesting to me because of his styling, more so than the lyrical content in this case. Two, how do you even write a song like this from a lyrical perspective? I would have a difficult time writing a song like this without having the idea that your lyric is a percussion instrument going into the process. These are both examples of what I was trying to get across about context. These don’t rival Ron Sexsmith’s lyrics by any stretch of the imagination, but are both extremely interesting to me in the context of the songs, as opposed to just the lyrics themselves. Alanis and Dave are artists that do things sonically with their lyrics, and saying that there is more “richness” in a lyric that didn’t depend on employing these unique and interesting methods, is quite a bold statement to me, and one that I would hesitate to agree with. The richness from these examples may not be the kind you or I would derive from a Sexsmith lyric, but one could argue a quality of richness present nonetheless. I’m anxious to hear your thoughts on these ideas. Also, I had an interesting idea for something for us to inspect. Ryan Adams just put out a new album, and one of the tracks is a very old song of his that has been basically rewritten for the record. I know somewhere I have a recording of the original version, and I think it would be pretty interesting to look at both lyrics, and look at how they evolved to the point where he was prepared to put it on a record. Anyway, if that sounds like something of interest, let me know and I’ll dig up those recordings and lyrics. P.S. Rap is the most obvious example of the skill of lyrical delivery above content (although this example has both if you listen to it). Guys, I will definitely come back to you after I inspect your texts more carefully. However, as a great Ryan Adams fan, I want to say it’s a wonderful idea to analyze the evolution of his text for the newly released old song. I’m also anxious to find out which one it is. Do that! I must hereby correct my previous (hasty) comment (if in fact anybody bothered to take it into account). It is quite impressive how very bookish and wordy essays (and correspondences, naturally) often contain less impressive ideas. Razor-sharp tongues and chilling irony are obviously a poor guarantee of insightful content. I would really like to tell you guys to “keep up the good work” but choosing such lightweight targets as Backstreet Boys for a critical comparison with Sexsmith, while possibly amusing for a brief moment, is, in a long run, close to comparing Mexican soap operas to Fellini’s work and calling it a serious analysis. At any rate, gentlemen, if I were to put your lyrics into music, personally, I’d choose Jonathan’s. He makes some good points. But I think Robs has just proved the point: why not look at Mexican soap operas and Fellini films at the same time? Don’t we have to take them both seriously in their own right? Like it or not, more people share telenovellas as a common reference than Fellini films. Similarly, more people are familiar with the Backstreet Boys than Ryan Adams. There’s a lot of potential in a Fellini-Mexican soap opera analysis: both use elements of melodrama, the absurd, carnal passion… In the end, I would argue they share more things in common than not. Plus it has the added advantage of inviting a democracy of readers; it would attract those interested in Fellini who had never seen a Mexican soap, and vice versa, as opposed to a specialized group with esoteric interests. I’m here to assure you that your comments have not gone unnoticed, and I appreciate your feedback. I was very curious how readers would take our correspondence, and it’s exciting to hear more opinions about what Clifton and I have started. This is an ongoing process of lyrical criticism, and it will only be made more enjoyable hearing the opinions of others as we make our way through this continued correspondence. Thanks for your comments, and don’t hesitate to add your thoughts and opinions. I, for one, will be reading them, and replying when I can.